You’ve all heard of the fluffer nutter, right? A peanut butter and marshmallow cream sandwich. 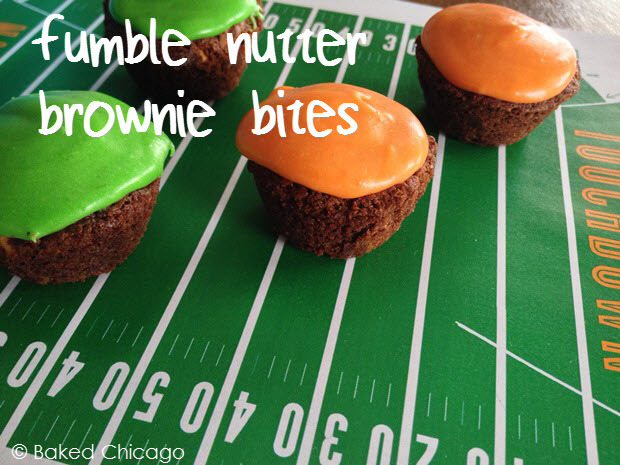 I don’t know a lot of football terms, but one I do know is “fumble.” And when I do brainstorming, I tend to think in sound-alikes so I started thinking about what I might do with a brownie for the Big Game. 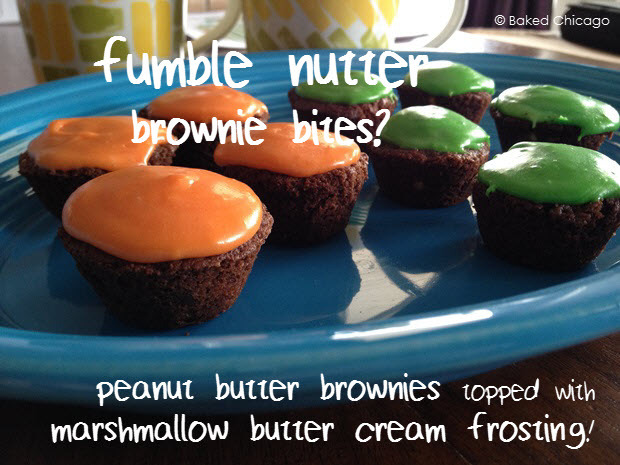 My brain went from ‘fumble’ to ‘fluffer nutter’ to ‘fumble nutter’ in about 90 seconds, so this brownie recipe incorporates yummy peanut butter and it’s topped with a marshmallow butter cream frosting. 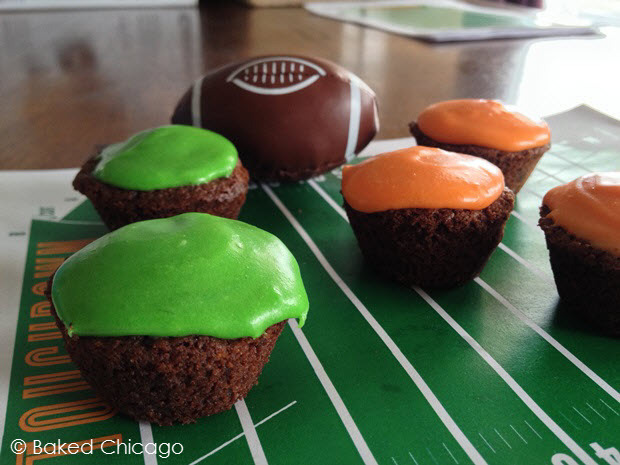 After you’ve baked the Football Fumble Nutter Brownie Bites, let them cool on a wire rack or platter. Then prepare your frosting. Frost half of your brownies in one team’s color, then the other. Let them set a bit after you frost them. I found they can set out for a few hours with no issues, but I recommend putting them in the refrigerator until you’re ready to serve them. We all know how long the Big Game can last and you want to make sure to practice proper food safety when entertaining your guests. For brownie bites: Preheat your oven to 350 F degrees. Generously grease a mini muffin pan with non-stick spray. Melt the butter in a microwave-safe bowl. Add the milk and eggs to the melted butter. Stir in the peanut butter. Stir in all the dry ingredients and mix just until blended. 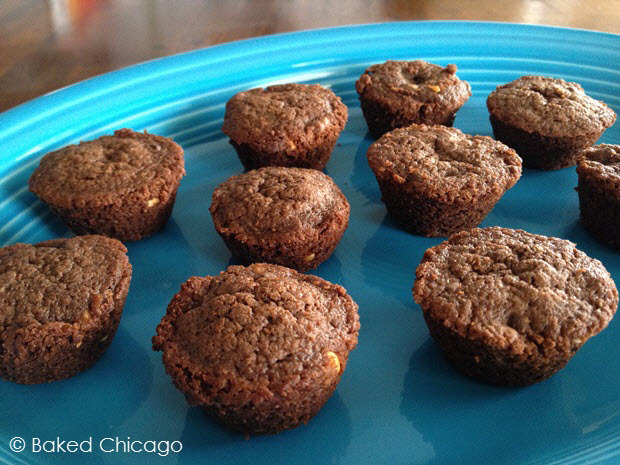 Using a small cookie scoop, add batter into the prepared mini muffin pan. 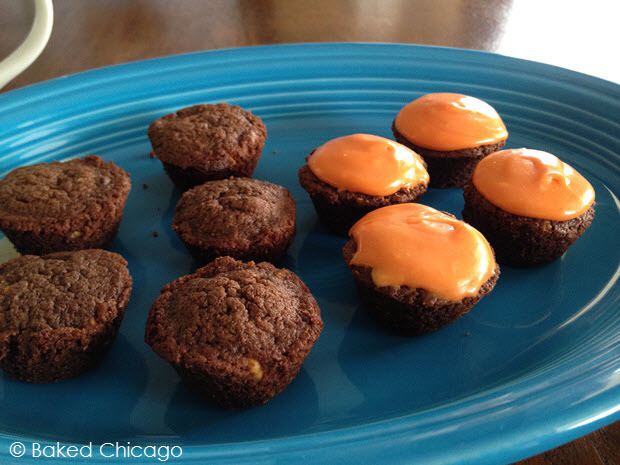 Do not fill the mini muffin cups more than 2/3 full, or it will overflow into the others as it bakes. Bake for about 12 minutes or until the brownies are dry around the edges. Cool before frosting. For frosting: Place the butter, marshmallow cream and vanilla in a small bowl. Beat with electric mixer on medium until well blended. Gradually add the confectioners’ sugar, beating after each addition until well blended. Blend in 1 tablespoon of milk. Add remaining tablespoon, if necessary, for desired spreading consistency. Frost brownie bite and let set.